At the request of our customers ongoing to get integrated search station for the detection and exploration of mineral and underground resources, at the same time far away from those big and bulky machines that is difficult to deal and work out, especially in the rugged and mountainous areas, and in areas that need to be guaranteed and accurate devices in the results and easy to use at once. The MWF group and after the diligence and research took several years to production MF 9700 QUINARY, a machine with substantive and technical specifications not insignificant, supported this device by latest modern scientific systems which our group developed through several stages to get, which other did not get that, to put a new mark in the world of detection and ground survey. Supported the device with six search system for the detection and exploration for gold, metal, treasures,relics,groundwater and voids , and to determine their location and confirm their presence points 100% , by using the six systems that give the user blindly trust to reach his target and find it without any hesitation. The systems supported by the device gives you a long-range scanning to detect and locate the targets from a far distance, and verification ionic search system to confirm the target, In addition to the geophysical survey techniques systems, with smart and automatic analysis of the target, type and depth, except for magnetic scanner system ( Ground Sensor) with sound data and graphic to confirm the targets sites and distinguish between them, and Finally the Ground Scan System, gives you a clear photo about the target. All this and more is available in a single device with proven effectiveness and with a large HD color screen, displays the control systems of advanced smart programs, and displays all the results and coordinates about research and survey. 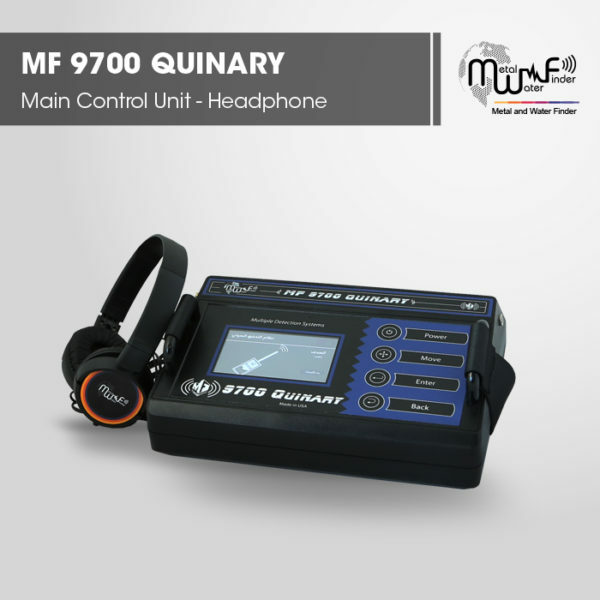 MF 9700 QUINARY” this device works by most accurate and the latest Multi-detection systems that gives you reliable and complete results about the targets underground. 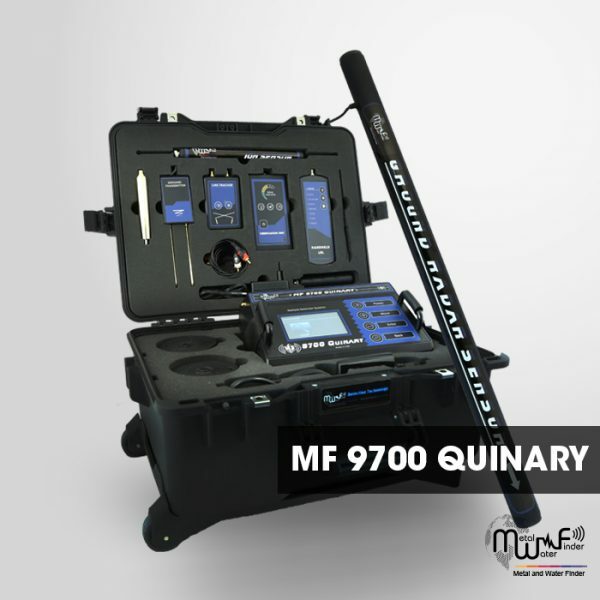 MF 9700 QUINARY Specializes in the detection and exploration for gold, treasures, metals, voids and groundwater, and distinguish between them, determine their locations within multiple search data about targets, types, sizes and depths as well. MF 9700 QUINARY Software is a very sophisticated level of technology, gives the user a fast and easy control of all device settings and systems. The ergonomic design and streamlined shape gives you the power to search and navigate with lightweight and ease of use, which play a big role in quick and uncomplicated results. 4. Detects the magnetic fields of targets and clarify the values. 6. Imaging the magnetic fields of ground, And analyzing and processing the results. Gold – gold ore – Silver – Copper – Brass – Bronze – iron – groundwater – voids – gems. Yes, can choose the target type before start search from the list of targets, Or automatic detection of discovered target. 70m for all targets and 450m for water with a control property in the depths level, through depths options list. 4. Indicators of graphical data, sound, oscilloscope and signal strength, on the screen. 5. Automatic results about the target, type, name, depth on the screen. 6. Image results of the target shape.